Many different occupations require a worker to work at or from a height such as builders, roof workers, painters, electricians, plumbers, scaffolders, tilers, truck drivers and a multitude of other trades. Working from heights means working where falling would mean falling from one level to another. Working at a height can pose a serious or life threatening risk of injury. Falls from a height are a major cause of death and serious injury in Australian workplaces. Over the eight-year period from 1 July 2003 to 30 June 2011, 232 workers were killed following a fall from a height, 11% of all workers killed over this period. In 2010–11, 29 workers died following a fall from height equating to 0.25 fatalities per 100 000 workers. Painting trades workers (14 fatalities), Building & plumbing labourers (12), Truck drivers (10), Plumbers (10), Deck & fishing hands (9), Electricians (8), Handypersons (8) and Storepersons (8). Half of the falls that resulted in a fatality involved distances of three metres or less in the eight years 2003–11. Falls from ladders accounted for the greatest number of fatalities (37 fatalities 16%). This was followed by falls from vehicles (27) and falls from roofs (25). Whilst falls can also occur at ground level by falling into holes, trenches or service pits, the above statistics show that workers who work at or from a height are at risk of injury or even death if appropriate control measures are not put in place. Under WHS legislation, the PCBU has the primary duty under the WHS Act to ensure, as far as reasonably practicable, that workers and other persons are not exposed to health and safety risks arising from the business or undertaking. Workers also have a duty to take reasonable care for their own health and safety and that they do not adversely affect the health and safety of other persons. Workers must comply with any reasonable instruction given by the person conducting the business or undertaking. Where an occupation requires a person to work at height, all reasonably practicable steps must be taken before commencing work to identify any risks to health and safety that working at height could pose. It may be necessary to carry out a risk assessment in consultation with workers to identify the hazards and risks that a person might face so appropriate controls can then be implemented. the adequacy of procedures for all potential emergency situations. You may perform a single (or generic) risk assessment if you are responsible for a number of different work areas or workplaces and the fall hazards are the same. However, you should carry out a risk assessment on individual fall hazards if there is any likelihood that a person may be exposed to greater, additional or different risks. Once a risk assessment has been completed, including consideration of the likelihood of a fall occurring and the severity of any injury that may result, appropriate control measures must then be implemented to eliminate or minimise the risk of injury. The WHS Regulations require duty holders to work through the hierarchy to choose the control that most effectively eliminates or minimises the risk in the circumstances. This may involve a single control measure or a combination of two or more different controls. 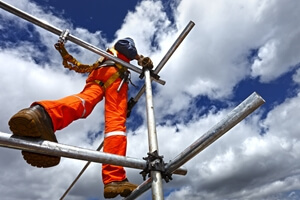 Are you aware of the risks of using scaffolds? Can the need to work at height be avoided? Carry out any work on the ground where such work could involve the risk of a fall if undertaken at height. This might include things like prefabricating roofs at ground level; prefabricating wall frames on the ground then standing them up; reducing shelving heights to allow access to items from ground level ; or using tools with extendable handles such as paint rollers. Working on solid construction means ensuring that a raised work surface is structurally capable of supporting required loads; providing barriers around the external perimeter of a raised work area and any opening in the floor to prevent falls; ensuring even and accessible work surfaces and slopes; and safe entry and exit points. Examples include working on solidly constructed stairs with fixed handrails or roofs with appropriately installed guard rails around the edges. Providing a fall-arrest system, so far as is reasonably practicable, if it is not reasonably practicable to provide a fall prevention device or a work positioning system. This includes systems such as catch platforms; industrial safety nets; and individual fall-arrest systems such as a lifeline, harness and rope grabs. The system implemented must be inspected before each use to limit the free-fall distance and ensure the system is in a fit and proper condition for continued use. Ladders are frequently used when working at height. However, if used inappropriately or incorrectly, falls can occur when working on ladders. When using a ladder, ensure that the appropriate ladder has been selected for the task; it is only used for short-term work; it is set up and used correctly and safely; and three points of contact are always maintained. These should be used to support other control measures and should generally not be used as the sole control measure. Administrative controls includes warning signs; permit systems (only allowing trained people in certain areas); organising and sequencing work to not interfere with other jobs; and safe work instructions and procedures. In some instances a combination of control measures may be necessary to provide a safe work environment. Work of long duration and higher frequency will usually require control measures higher up in the hierarchy to provide adequate protection, such as using a mobile scaffold instead of a ladder. Any control measures used must not create new hazards. Working at Heights Training AlertForce offers the brand new nationally recognised RIIWHS204D Work Safely at heights course, which supersedes the older RIIOHS204A course. On completion, workers will possess the most up to date qualification, which provides a further range of in-depth knowledge to ensure their safety is of paramount importance. ‘Work-related Injuries and Fatalities Involving a Fall from Height, Australia, October 2013’.